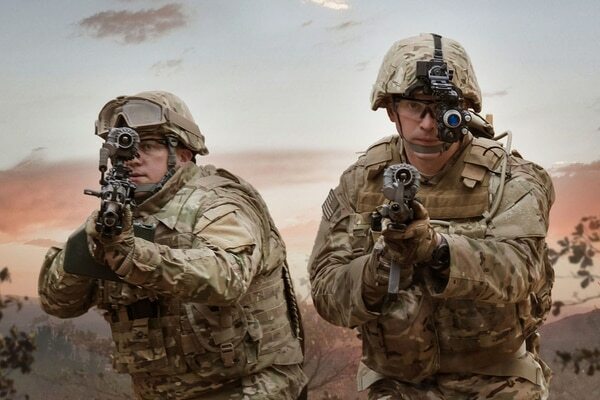 An as-yet identified unit will be the first to field an advanced, binocular night vision goggle that incorporates day/night optics and thermal and targeting capabilities, all in one package, by this time next year. Speaking at the Association of the United States Army’s annual meeting this week, three leaders tied closely to work on improving soldier lethality shared details of the goggle’s development and timelines. Brig. Gen. Anthony Potts, who leads Program Executive Office Soldier, said that 10,000 pairs of the Enhanced Night Vision Goggle-Binocular, or ENVG-B, will be fielded to Army units starting next fall and through 2021. The specific unit to first receive the new goggle has not been identified, but it will be a close combat-focused unit, likely infantry or cavalry scouts. The Marine Corps is scheduled to receive 3,100 systems over that same period, Potts said. But first, in the coming months, some Army units will get an immediate upgrade with the ENVG-III, which has some of the same capabilities but in a monocular setup. While the day/night optic and thermal vision is an advance over much of the night vision being sported by soldiers now, the key change is the Rapid Targeting Acquisition feature. This is a wireless connection between the soldier’s weapon and the vision device that allows the shooter to line up the target via the weapon sight camera. Soldiers can shoot from the hip, around corners and in other novel ways not available with current systems. And early data is proving promising, officials said. Brig. Gen. Dave Hodne, director of the Army’s Soldier Lethality Cross-Functional Team and Infantry School commandant, shared results of recent ENVG-B testing on the range. Previous estimates about fielding the device suggested fielding was more than three years away. Part of the reason fielding has been sped up is the additional funding and top leader prioritization of the program, which officials say makes an immediate impact in marksmanship and lethality.